My daughter is a little bit obsessed with the Cartoon Network’s Krypto The Superdog, a cartoon caper featuring the titular Krypto – Superman’s childhood pet, apparently – and Ace the Bat Hound, who goes up against the Joker’s hyenas and various other supervillains’ super pets. 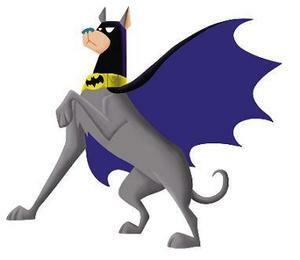 It’s funny stuff, but the funniest thing of all is that my daughter *becomes* Bat Hound. Her eyes become slits, her back straightens and her voice thickens. If you’ve ever wondered what Christian Bale’s Batman would be like if he were a dog played by a three-year-old girl, then my house is the place to find out. As a result of all of this, I was woken the other day from a perfectly pleasant late afternoon nap to discover Ace the Bat Hound on my bed. “Time to get up, daddy,” the Bat Hound snarled. I said something groggily, and the Bat Hound’s eyes became narrower still. “Time. To. Get. Up.” And with a swish of a cloak – actually a pink raincoat, its hood hooked over a three-year-old’s forehead – the Bat Hound moved to the end of the bed. Two front paws were raised, superhero-style, and a single command was barked: “Doggy slide!” And then the Bat Hound was gone.